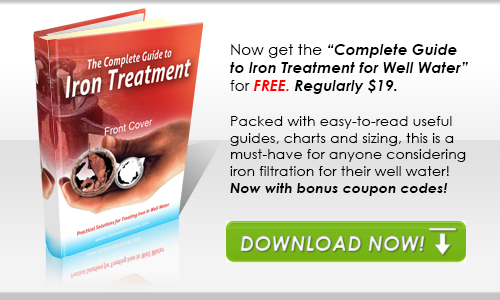 Clean Well Water Report: Can I use Peroxide to Treat Rotten Egg Odor and Iron? Can I use Peroxide to Treat Rotten Egg Odor and Iron? Our country cabin uses well water and has a very strong rotten egg odor, as well as a high level of iron in it. I have tried adding chlorine to the well, and it does help, but the water still has a bad taste to it. A friend at work suggested we use hydrogen peroxide. Can you send me information on this? How does it work? We also have hard water, but we have a softener already. How does the cost of peroxide compare to chlorine? Thanks for emailing. 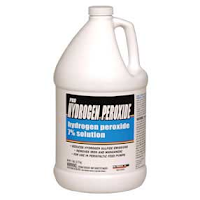 Peroxide can be an excellent way to eliminate the sulfur odors and treat iron, when it is combined with an auto-backwash filter that will remove the rust and sediment. After the water has been injected with peroxide, the odor will be gone, but a lot of rust and sediment will be present. At this point (see diagram below) the water flows through an automatic backwash filter to remove the rust. The final stage would be your existing softener. Unlike chlorine bleach (which is sodium hypochlorite), hydrogen peroxide adds no salts or other chemical residual to the water. After interacting with the water, peroxide breaks down into oxygen and water. The hydrogen peroxide would be injected with a metering pump, feed into a contact tank to provide enough time for the solution to react with the heavy iron in the water. Then, the water could pass through a catalytic carbon backwash filter to remove the peroxide and oxidized iron, as well as any tastes and odors. A lot of people ask questions about diluting the 7% hydrogen peroxide. The main question is about how much water is needed to be added to the gallon of hydrogen peroxide to dilute it to 7000ppm or 12500ppm. This is a good question, and the first step is understanding how many PPM 7% peroxide is. Since we want to solve for parts per million, 7% of 1,000,000 is 70,000. So 7% peroxide is just another way of saying 70,000 PPM. If you used the 7% solution without dilution, your solution strength would therefore by 70,000 PPM. By adding 9 parts of water, for every 1 part 7% peroxide, you would end up with 7000 ppm. Questions about the cost of peroxide is also common. Peroxide can cost more to buy upfront than bleach for a similar concentration. For example chlorine bleach commonly costs $2 to $5 a gallon for 5% to 7% chlorine. However, peroxide may cost $10 to $14 a gallon for a 7% peroxide solution. So in a straight comparison, peroxide seems more expensive. But peroxide acts approximately twice as fast a chlorine. For example, 1.o PPM of iron takes 0.6 to 1.0 PPM of chlorine to be oxidized. But it only takes 0.3 to 0.5 PPM of peroxide to oxidize the same 1.0 PPM of iron. Since less peroxide is required, it can end up being a similar cost to chlorine. One way to save money on peroxide is to buy it locally in a higher concentration. For example, we sell 7% peroxide, which is safe to ship and handle. However often peroxide can be purchased locally in your area, at a higher concentration of 15% to 35%, at a cheaper cost, although care must be taken when handling it and it may require dilution before injecting it. Average use is 1/2 gallon to 2 gallons per month depending on level of odors and amount of water used. 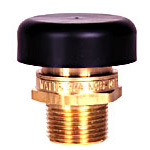 Includes 1.5 cubic feet of catalytic carbon filter media; and Digital 5700-E control valve. All the filter media you need for the system is included. Excellent for use in de-chlorinating water, taking out hydrogen peroxide and removing many tastes and odors. Catalytic carbon is the absolute best filtration media to use for removing chloramines.